Superfast Berkshire and particularly the Royal Borough of Windsor and Maidenhead just added a bit more superfast broadband coverage as the Call Flow Solutions roll-out has completed 12 cabinets. We are delighted to have completed the vast majority of our fibre superfast broadband network in the Royal Borough on time. Working in and around central Windsor has presented a variety of interesting challenges which involved careful co-ordination between a number of parties. The more outlying areas have been less difficult and we are now looking forward to connecting our first superfast customers. Experience shows that there is significant demand for fast internet, and we plan to raise awareness of the newly available services at every opportunity, so that potential customers know they can finally move out of the digital slow lane. The roll-out means an extra 1,750 premises have now gained access to superfast broadband in the Royal Borough, there is one small bit of outstanding work that will improve speeds for those in the Temple area with a reach extension improvement to help those on particularly long lines. 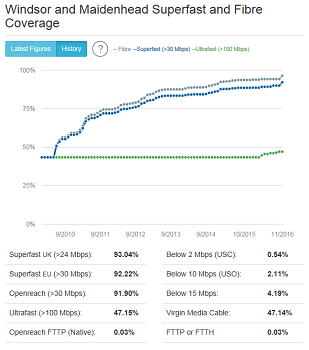 The improvement in the area from the Call Flow roll-out is shown by the jump in the fibre and superfast coverage levels. 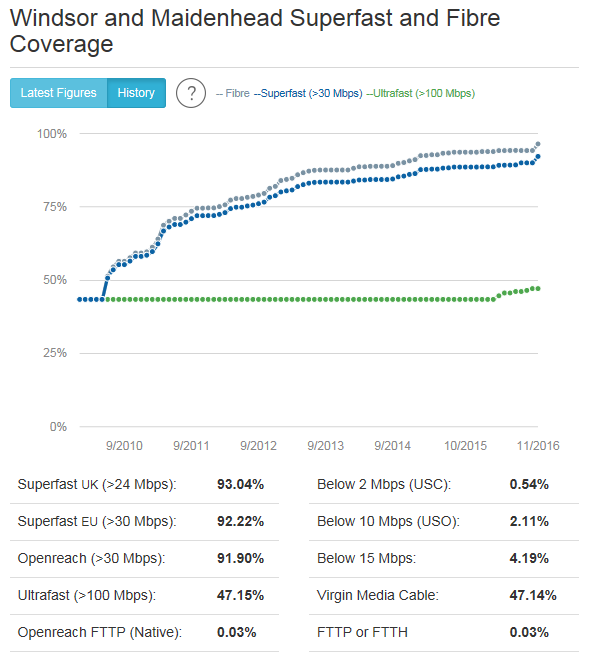 We are currently using the same VDSL2 profile for the postcodes covered as we use for Openreach, but will review this over time as we see more speed test results, and we have also added the other Call Flow areas we know about to our stats. (b) assuming they do provide wholesale services, which ISPs make use of them. For the large ISPs it's a big expense to integrate a new wholesale supplier. Well neither Talktalk or BTWholesale offer FTTC service currently on a test postcode TW19 5AA I extracted from the Superfast Berkshire interactive map.